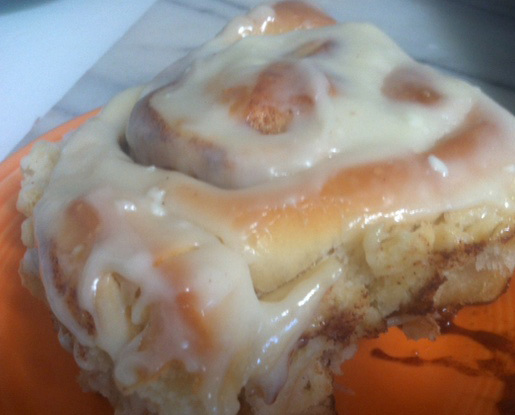 I have made a lot of cinnamon rolls at the bakery but this ones the best. I made some this morning and they were great. I’am adding this one to my recipe book! In a large 5 quart mixer combined all the ingredients except for the filling and frosting. Using a dough hook, mix everything together. Make sure the dough come clean from the bowl while mixing. If the dough appears too wet and sticky add a little flour, if it appears to dry add a little more warm water. You should see the dough form a ball and come clean from the bowl. Continue to mix in the bowl for approximately 10 minutes, unless you prefer to knead by hand. In this case once the dough had formed the ball you can pull the dough from the bowl and place it on a lightly oiled surface and knead approximately 10 minutes. Place the dough back into the bowl and cover until doubled in size. Mark the rolled dough every 1 1/2″ and cut them using some dental floss or a very sharp knife. Dental floss works well, (place the string under the roll and criss-cross the string over the dough then simply pull up). Place the rolls into the prepared pan, cover and let rise until double in size. I use my microwave as a proofer by placing a cup of boiled water in it with the pan and close the door until the dough doubles in size.